These versatile colors are ready for direct application with brush, stamp, squirt bottle, airbrush, or whatever. They are absolutely colorfast on both natural and synthetic fabrics. No special techniques are required. Used straight from the bottle, the colors are intense and semi-opaque. When diluted with water (or the Extender), these paints have qualities of the best watercolors. Colors can be bright and transparent or light and pastel. All colors are blendable. Set of 8 — Includes 2.25 oz jars in 8 colors: Yellow, Orange, True Red, Violet, Sapphire, Emerald, Black, and White. Set of 6 — Includes 8 oz plastic jars in 6 colors: Yellow, True Red, Navy Blue, Emerald Green, Black, and White. Exciter Pack, Textile Traditionals — Intense colors for beautiful brushed results on natural fabrics. Kit includes 0.5 oz (15 ml) bottles in 9 colors: Scarlet, Violet, Sky Blue, Turquoise, Apple Green, Goldenrod, White, Periwinkle, and Russet. Earth Tones, Set of 8 — This set contains 2.25 oz jars of Raw Sienna, Burnt Sienna, Mars Red, Raw Umber, Burnt Umber, Brown Ochre, Terre Verte, and Neutral Gray. 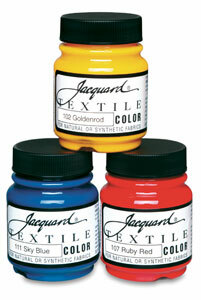 To view a PDF of instructions for Jaquard Textile Ink, please click here.